Our oldest son loves all things history-related. I wanted to teach him about the Lewis & Clark expedition and the group of adventurers (the Corps of Discovery) that explored the lands acquired in the Louisiana Purchase and the Oregon Territory. 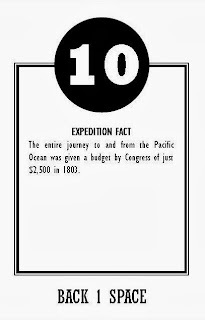 It took a little more work and research than I'd planned, but at long last, the board game I made to retrace their steps and learn expedition facts was complete. It was time to play! What you need is a die and small game pieces. We used two different colored glass babbles. Small buttons would work great as well. I'll supply the rest. Well, except for the paper. You'll need paper. Eleven pieces to be exact. With your printer fired up, download and print this free PDF. The first five pages are the game board. If you anticipate giving this lots of play, print on heavyweight cardstock for added durability. The last six pages are the game cards. I printed mine on colored office paper, punched a hole in one corner, and threaded them through a metal ring. This kept them in order, but isn't a necessity. Before my son and I played Westward Bound!, we read a phenomenal book by David A. Adler. This provided precisely the background my son needed to understand how truly phenomenal exploration of the western United States was in the early 1800s. To play the game, we put both game pieces on the black circle near St. Louis, Missouri. We took turns rolling the die and moving our game pieces forward (westward) the number of spaces rolled. The number we landed on, determined the card we read (for example, if we rolled a six, we moved six spaces, landed on 33, and read the 33 card). Encourage players to read the cards aloud so that all players learn more facts and milestones. At the bottom of each card are instructions to either stay put or move forward or backwards. The player must move their game pieces if the card dictates. The player will not read the card for whatever number they eventually land on during their turn, though. Play alternates between players until one player reaches Fort Clatsop in Oregon first. This player is the winner (which unfortunately, was not me). The good news, though, is that my son has already asked to play again! DISCLAIMER: Is this board game perfect? No. Some of the dates and events don't match with the geographic location noted on the board. 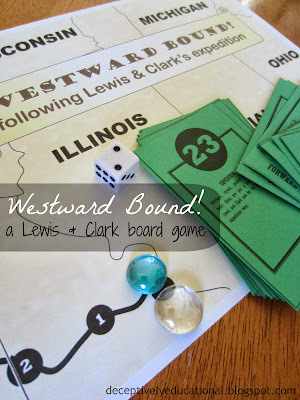 I did my best to match them up when possible, but in order to pace a child's progress along the westward route, and not have all the stops grouped together, sometimes it just wasn't possible. So while the events are historically accurate, the geography isn't always. Wow, you rock - it's an amazing idea. Pinning and sharing it ASAP. 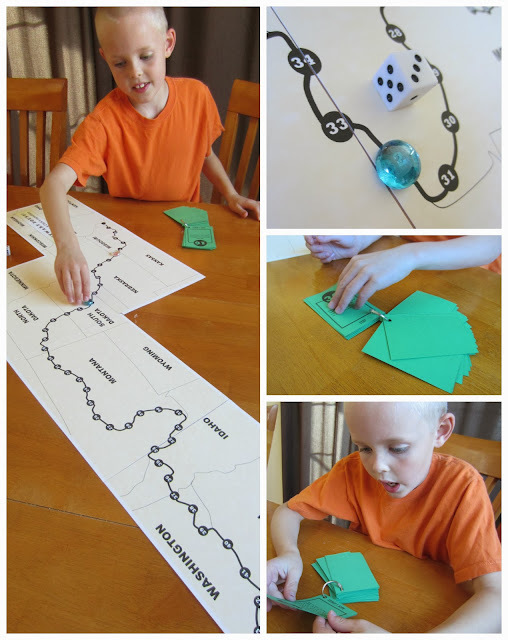 We are getting ready to "explore" the Oregon Trail in our homeschool, and I think this game would compliment the study beautifully! As always, thank you for your generosity in sharing your hard work with us all! Did you see our Lewis and Clark game? Looks a lot like this one, although not nearly as polished looking as yours. I hadn't seen your game, Phyllis, but it looks great too! Great minds think alike. I love that you used keelboats pictures as game pieces! That is SO clever! Thanks for the game! We are in the middle of a big Geography for Kids homeschool study. This will be great. 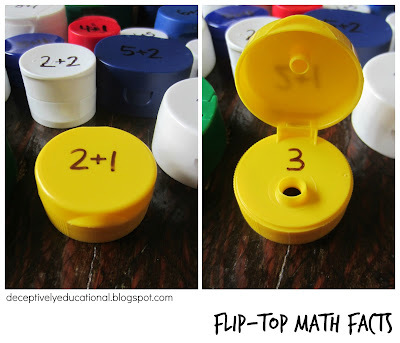 Going pin and share with my blog readers in the upcoming weeks. THANK YOU SO MUCH! this is just what my girls need for a fun learning adventure with L&C. Thanks for sharing this WONDERFUL game! Our kids really enjoyed this. We played it last week and I gave you credit on our blog. Genius. Keep doing what you do. and... thank you. Liking the looks and play of this game. I like the "learning" rather than "quizzing" of information. By having the players constantly reading the facts over and over in order to play the game, learning will happen....especially if it is review after having read a Lewis and Clark story. GREAT GAME! We will be making one and looking for a book or two to read along with this. Thank you for your amazing work! We love to play games as a way to learn and review. We just started our Lewis and Clark Unit Study; this will be perfect! I can't wait to try this with my kids this week as we started talking about Lewis and Clark. Thank you so much! I cannot wait to use this with my students.